Written by Janet Choi on October 19, 2017 . Email bombardment is a fact of life. That’s why you can’t send random blast emails and expect a response. Your emails get lost and buried in your customers’ inboxes. That’s where triggered lifecycle emails come in. Lifecycle email campaigns work to nab attention and persuade, to talk to people in a way that makes sense to them, with the right message at the right time. But it can be challenging to achieve all those “right” elements (right person, right message, right time) — and persuade people to follow through. How do you guide your users and customers to achieve the things they signed up to do? I was surprised to find one of the best analogies for how to accomplish this from the role-playing game Dungeons and Dragons (D&D) — specifically game designer Chris Perkin’s concept of designing an invisible railroad. Our quest: find out what invisible railroads have to do with building effective lifecycle campaigns. Let’s get to it. Even though the DM creates and narrates the story, she doesn’t predetermine every step of the plot. The game is meant to unfold and develop based on how the characters act. “Even in its simplest form, D&D is all about making choices and dealing with the consequences,” explains Chris Perkins, who’s known as a Dungeon Master living legend. Sometimes the DM forces players into scenarios, with no way for them to respond with agency. This is called railroading. For example, let’s say players stumble into a riot during their journey. A natural reaction is to turn around and get out of there. The DM could railroad players by blocking all escape routes, forcing them to stay and fight. 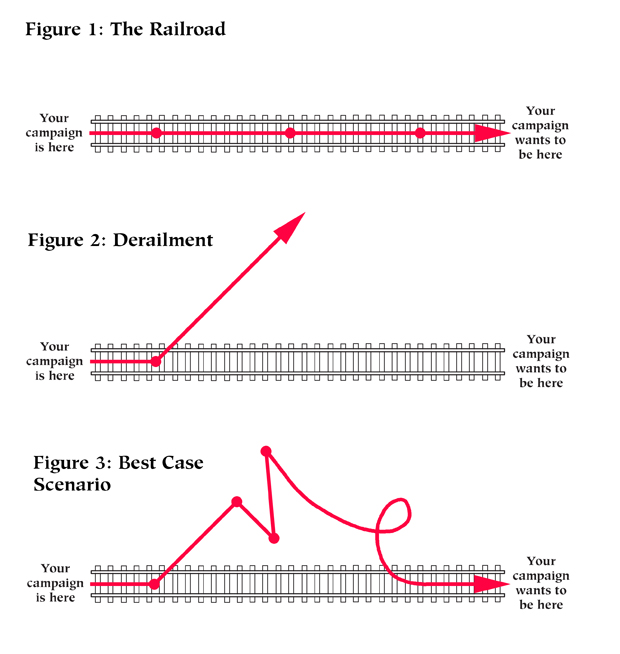 Perkins explains that railroading was a mistake he used to make as a rookie DM: “I created adventures that were very linear and railroad-y and didn’t really offer players even the illusion of choice.” Railroading can easily happen in lifecycle email campaigns. Instead of designing around and for customer actions, businesses often send email to try to force their recipients down stringent, business-serving paths. But railroading isn’t all bad if you can get beyond the one-sidedness to take into account customer choices and a collective world you and your customers inhabit. [W]hen I plan out the events of a game session, I’m basically laying down an invisible track that I hope my players never see. This track is what guides my campaign toward its intended destination. If all goes perfectly, my players will make decisions and take actions that push the story farther along this track until, finally, I’ve gotten them from Point A to Point B. Figure 1: The good news is that the players have done exactly what you expected them to do. The bad news is that they probably feel railroaded and have no way to affect the outcome of the campaign. Figure 2: The good news is that the players are making decisions that affect the campaign. The bad news is that you don’t know how to steer them back on track. Figure 3: The good news is that you’re allowing players to chart their own path while cleverly steering them toward your intended destination. The bad news is that you’re exhausted from all the fun everyone is having. How does this apply to email campaigns? In D&D, the players’ characters exist in the DM’s world. When there’s obvious railroading, the game simply bends to the DM’s will, which makes for a disappointing game, or encourages players to sabotage the storyline. In email marketing, it’s impossible to effectively railroad users into actions you want them to take. Otherwise, you’d be seeing 100% conversion rates. As much as we’d like to think this is the way the email world operates, this sequence of orderly events, in which users proceed straight from Point A to Point B to Point C, just doesn’t happen: In the email marketing context, people can, and do, simply stop playing altogether. They may have signed up and agreed to step into your product’s world but they can end that collective journey, the story you’re trying to tell (and sell), at any time. They don’t come back to your app or service, they don’t read your emails, they don’t open or click. 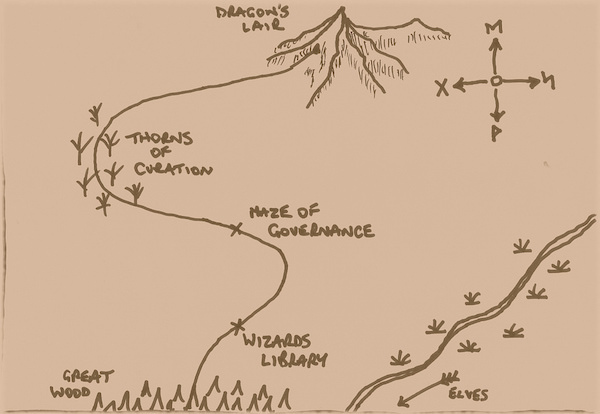 You may be the “Dungeon Master” of your product, but your players are protagonists of many other worlds and their own stories. That’s why Scenario 2 is what most of us are dealing with. Users go off your rails altogether. For example: a common point where this derailment happens is right after signup. You’ve designed your first run experience and included onboarding tours and sent helpful tips in onboarding emails — and yet, there they go, never to return. They got distracted by a text message, or another browser tab, or went out to lunch, or embarked on whatever millions of possibilities in their life story that doesn’t involve your product. Your best case scenario? People go off and decide to do whatever else — whether that’s abandoning your app and forgetting about it or checking out an advanced feature rather than downloading your desktop app like you’d planned. But with responsive lifecycle emails, you can gently shepherd them back on track in their overall product journey. By considering user context and behavior, you can create triggered lifecycle campaigns that work as invisible railroad tracks. This way, you take into account customer choice while also trying to architect those choices to serve your particular story. You’re allowing your users to chart their own path (which they’ll do anyway) while cleverly steering them toward intended destinations and specific experiences in your product. Players are traveling along a path but decide to take a detour to explore a village. As the players get further away from the intended story line, the DM introduces the village shopkeeper, who tells them about a mystical object he heard about in an abandoned castle. The players decide to head back to the path in search of the castle. The players could have spent more time in the village and gotten embroiled in a random battle, derailing them from a particular campaign. By introducing some intriguing gossip from a villager, the DM offered a gentle nudge to get players back on track. This is what Perkins calls a signpost, a decision point he creates to try to steer the campaign back on track. The point is to offer information in a way that authentically piques player interest — and to do so in more than one way. Your email campaigns are digital signposts. They nudge customers with interesting, persuasive, and helpful information at opportune times to get them back on track in your product. Email is a powerful engagement and conversion tool when it’s used the right way. It all comes back to your customers and whether you’re providing value to them. Listening is the most important skill to be a great DM, according to Perkins. “Try to listen more than you talk,” he advises, “because a DM who listens can better understand what the players are trying to get out of the game. You can look for opportunities to take the game in interesting directions.” The same goes for being a great customer lifecycle master. Your emails aren’t a way to order your users around to do exactly what you want — and the more you approach email marketing that way, the more you’ll fail. You have to understand what your players are trying to get out of your game to lay down an invisible track that helps them make progress towards their goals. Your success is tied to theirs. What do you think about the Invisible Railroad approach? Share your thoughts in the comments!